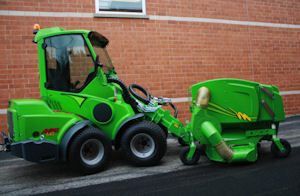 A new Avant compact loader unit has recently released in the US, offering the same articulated design and power, but now with a dual speed option. The Avant 640 brings more drive speed to the 600 series. It’s equipped with the same Kubota diesel engine as the Avant 635, but thanks to the powerful 2-speed drive motors, the top speed of the 640 is 14 mph in second gear, as compared to the 635 that tops out at 9 mph. More than 100 Avant attachments easily attach to and detach from the machine, making it versatile for use on several different tasks.